Aren't silhouettes a charming way to capture loved ones? Shortly after our second was born, I was inspired by a wall of family silhouettes in Stephanie Nielson's home, thinking "I can do that! 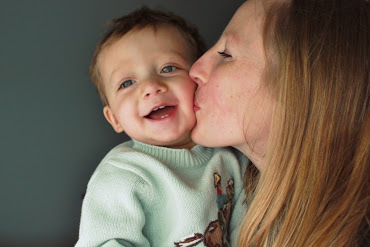 I'd love some of us, or at least the children, in our home." Well, life happens, and 2 years passed...until last week. 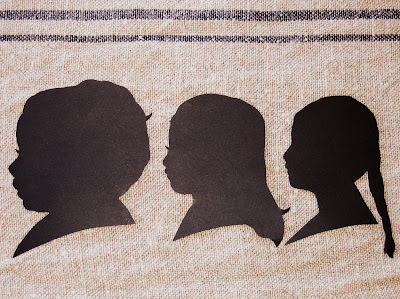 My sister shared that she was doing a book review of Silhouette Art by Vana Chupp, and she asked if I'd like to join her, putting one of the book projects to the test. Hearing we'd be creating family silhouettes, I was eager. Yesterday morning I had each of our children with a shoulder as close to a wall as they comfortably could and look straight ahead. 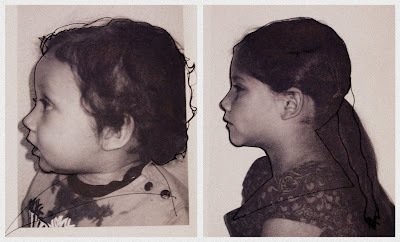 With a fair side profile shot of each, I downloaded my images on the computer, roughly sized the top of their heads to the bottom of their hair or "bust" to fit a 5 by 7 frame, and printed. 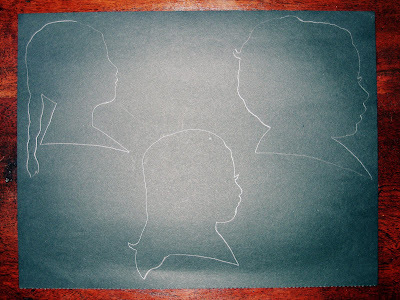 Joining my sister in the afternoon, we began by tracing the "outline" of each child with a dark pen, taking some liberties with hair details and hairstyle. Then with very, sharp scissors, we cut on the lines that were representing our children. 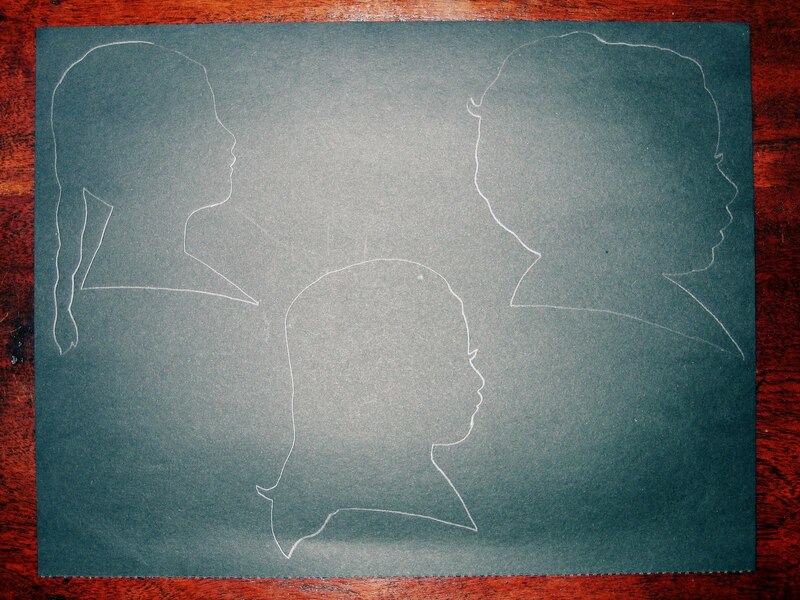 We chose to trace our template images on solid black paper. Be warned: dirty fingers and glue smudges show up easily on this color. However, I was able to use a clean, cotton cloth to rub away one of my "imperfections." You risk the image looking less like your original with each additional trace and cutout. So the key: careful lines (tracing and cutting) and sharp scissors! The background came next. My sister had vintage sheet music which I loved, but I chose a couple papers included in Chupp's book. 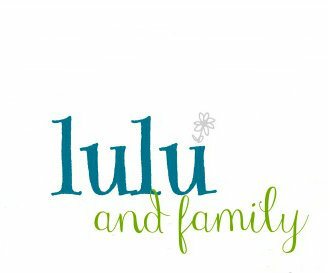 Their quiet colors and patterns emphasized the children's details a bit more. The project was easy and fun, especially working together with my sister. 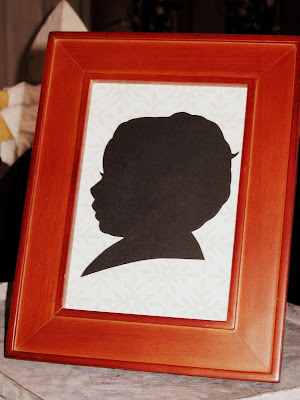 Now, all of these different silhouette craft ideas are running through my mind. 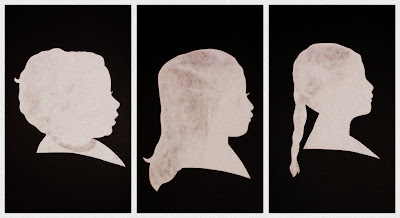 And that's what Chupp's book is really all about: creating in a wide variety of ways with silhouettes. Last night after our spaghetti dinner, I placed our dirty, sauced-faced children in the tub seeing my favorite reason for these "shadow" busts we created. No need to brush those poppy seeds out of your teeth, that fruit pop stain on your forehead can stay, and hey, getting out of pj's is over-rated sometimes. It's simply capturing the unique, beautiful lines that make you (or your loved ones) you!